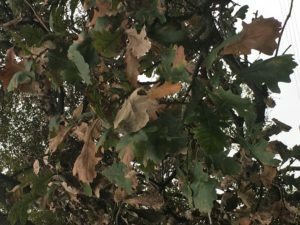 During late August and September of this year, Forest Health staff received several comments about problems with white and burr oaks. Leaves on affected trees turned brown, curled and died prematurely. Some trees were almost completely affected, while others only mildly. Symptoms varied widely between trees, even between those located next to each other. After examining several samples, the DNR Forest Health Lab concluded that damage was likely caused by fungal leaf pathogens and the twig canker fungus Botryosphaeria. Because the damage occurred late in the growing season, afflicted trees will not likely suffer major impacts. Although Botryosphaeria can cause twig dieback, oak trees usually recover without long-term problems. As noted in the August edition of Forest Health News, cynipid gall wasps were found on burr oaks in several areas throughout the state. Affected trees should leaf out normally next spring, but additional stressors such as spring frost damage may affect the outcome.